Taking the lead at all in the game at Penn State during the second half was an impressive feat...but in the following minutes, the under-manned Boilers seemed to completely run out of gas...In fact, our Boilers couldn't manage a single point for about 7:00 following clawing back into the game; and Penn State finally sealed the win, 67-64. Make no mistake, Pringle, Battle, Jones, Morrissey and Cornley all played very well. Purdue had no answer for Cornley, especially in the first half, and both Pringle and Battle seemed to score nearly at will for large chunks of the game. So when an offensively-minded, two-loss team gets a 14-point lead, it's going to be darned-near impossible to win...and it turned out to be just that for Purdue. The closing minutes of this game were sickeningly-similar to the Illinois loss- rebounding & loose ball opportunities weren't siezed and no one seemed willing to take the shot...EXCEPT, LewJack. He made a lot of mistakes during this game, but the mentality he showed in the closing minutes is why I like him so much. 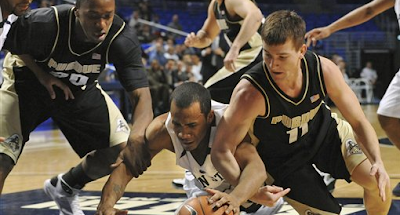 While Smooge couldn't create space between himself and his defender, Grant continually handled the ball sloppily and Johnson couldn't match the muscle of PSU's bigs, Jackson did what no one else in gold and black could or would do- put points on the board. At this point, any thought of a Big Ten championship or a high ranking should be expunged from Purdue's collective minds. Now, the focus must be to simply get better each game and re-gain the offensive flow that has been completely lost for nearly a month. Also, I don't think it makes any sense to rush Hummel back into the line-up. Back injuries can ruin a season and even a career, so the big picture needs to be kept at the forefront right now for Painter, the Ostrich ad everyone else involved. The Big Ten is a damned-tough basketball conference this season, regardless of what heads tell you in the media...and this Purdue team without a healthy Robbie Hummel and Chris Kramer, simply doesn't have the firepower to be in the top-half of the conference. I salute the second half effort today, and love the fact that Smith got more involved and Riddell was doing everything he could versus the talented PSU guards...but I felt like I was rooting for the Purdue team of Painter's first season as those two and Green played significant minutes- the effort was there, but the talent is not Big Ten caliber top-to-bottom. Perhaps now, regardless of whom is healthy, Purdue can once again become the hunter, since they no longer will be considered the hunted. Jan 6 Props to the Paint Crew in the Keystone state!